A fantastic emulation of a classic synth that gives far more than the sum of its parts. Incredibly realistic analogue emulation. It sounds great. Amazing attention to detail. Every parameter lovingly re-created. Great sound library and extra features for complete sonic control. Step time grid is a little fiddly. 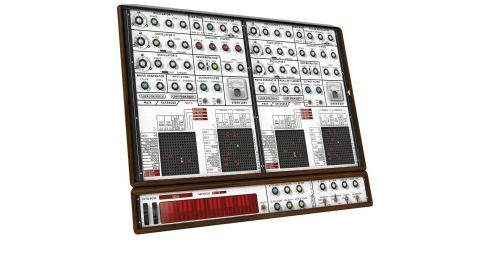 The EMS VCS3 is one of the great legends of the analogue synth world - now an emulation of its prototype VCS4 has been released as the XILS 4, from XILS Lab. Was it worth the wait? "With users such as Brian Eno, Pink Floyd and The BBC Radiophonic Workshop et al, the VCS3's status is well-deserved"
With users such as Brian Eno, Pink Floyd, Pete Townsend, Tangerine Dream, The BBC Radiophonic Workshop et al, the VCS3's status is well-deserved. However, there was a downside. While it wasn't particularly unreliable it was a bugger to get in tune and, once in tune, to get it to stay there was tricky (and we should know, we've tried!) Given that and its rarity, a great emulation sounds very tempting. The subject of this review is based on a prototype, the VCS 4, which was two VCS 3s in one unit with additional interconnectivity and, in addition, the 256 step digital sequencer. The two VCS 3s are displayed side by side in the plug-in window. As with the original, there is the synth itself and the routing pin matrix all in the one view. Each synth has six oscillators grouped in three pairs named Osc 1-3. These 'pairs' are two dedicated waveform oscillators with individual volumes and shared pitch and shape controls. Each waveform has an individual output on the matrix and so can be routed separately. Each oscillator has a sawtooth paired with a very smooth sine on Osc 1 and a very fat sounding square wave on 2 and 3. The pitch control is switched in octaves via the outer ring and fine tuned on the inner. All oscillators have a Low setting so LFO operation can be done from any of them, particularly useful when you have such flexible routing available. The filter section has 12, 18 and 24dB slopes, the latter two capable of self-oscillating, and they sound rich and analogue with clear and transparent highs and a punchy low-end. The main envelope has two pages, Shaper and ADSR, each having their own special characteristics and both use trapezoid architecture to shape the initial attack and decay of the sound. In addition you have a noise generator, a reverb unit and a dedicated hi or lo pass output filter for each of the two audio outputs. Click on the arrow to the right of the front panel and another control panel replaces the right-hand synth. Here you find a variety of pages accessed by tabs. The first is ENV/LFO which shows the LFO, a Sample and Hold Generator, a Voltage Processor and two Trapezoid envelope generators. These can be patched via the pin matrix and add huge numbers of additional sound-shaping possibilities. LFO and S&H can be set to sync to host tempo and all of them can be set to key trigger. Next comes the Matrix tab, which adds connectivity to the sequencer and to all the trigger functions. This is a very important page as, due to the modular nature of the instrument, you need to set trigger and gate for things like the envelopes or they won't work. Following that comes the Keyboard tab. Here you set polyphony and maximum voice count, glissando and portamento, glide times and controller ranges. You can also set two separate key follows, allowing scales other than equal temperament - particularly useful if you are using one oscillator as an LFO and want to move it at a different rate to the note pitches. Further on you find the Input tab which is where various pitch tracking, gate and envelope followers track an external input and can then control filters and envelopes so you can process external signals. Listen to the beginning of The Who's Won't Get Fooled Again to hear what that sounds like. Last up comes Effects. Here you have a Chorus, Phaser and Delay. I shall say no more than they are pure '70s and bloody marvellous! The sequencer is a classic step time model based around three layers each having two independent 'range' controls. There are various ways of programming them but probably the most simple and accessible way is via the step time grid. This is unfortunately rather small and although you can scroll up and down vertically it's fiddly and, as you can extend the sequence up to 128 steps, nigh on impossible to see and adjust once a sequence goes beyond 32 steps. "People walked into the studio and thought we were playing one of our old analogue synths and not an emulation"
This is a shame because it is an incredibly powerful tool that allows you to control envelopes and filter amounts independently of notes played - impossible to do just in your DAW. A separate full-screen editor window would sort that out. A future update please? With that single gripe set firmly to one side this is a stunning instrument. A large number of people walked into the studio and thought we were playing one of our old analogue synths and not an emulation. It's big, complicated with huge amounts of possibilities and lots to get to grips with, but it sounds fabulous and the time spent learning its subtleties will give you far more than the effort involved. It's like the real thing but better, and cheaper. Highly recommended.